I am excited to be offering 30 days of fun crafts to keep kids active and entertained this summer! You won’t want to miss a day of these fun crafts for kids from some amazing bloggers! Jessica from Zakka Life writes…..
Hi, I’m Jessica Okui from Zakka Life and am happy to be here today to kick off Craft Camp. It’s always truly a pleasure to contribute to one of my favorite craft blogs, Skip to my Lou. This cute little pennant necklace is a great way to introduce sewing to a child. 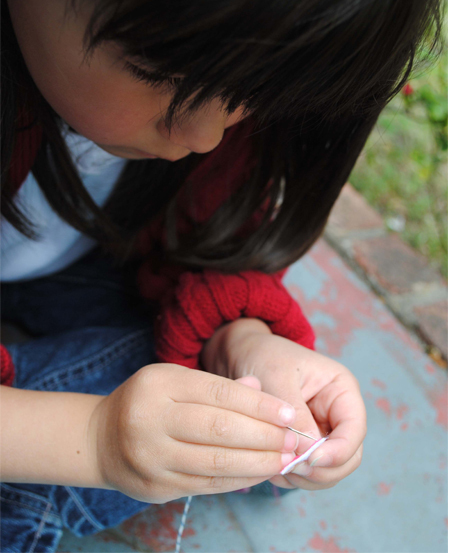 It gets them familiar with a needle and helps them prepare for making running stitches. 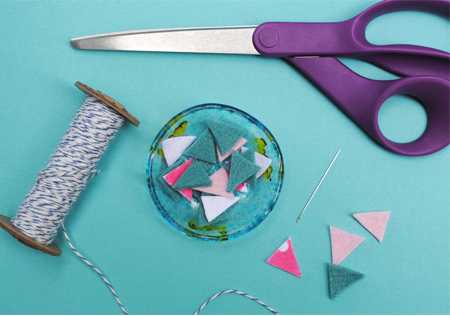 This craft is also a great stash buster for all those felt scraps. Enjoy. 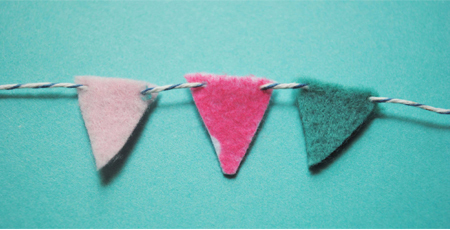 Bakers twine or Embroidery floss – Embroidery floss is easier to sew through the felt so depending on the age of the child, you might want to use it over the bakers twine. 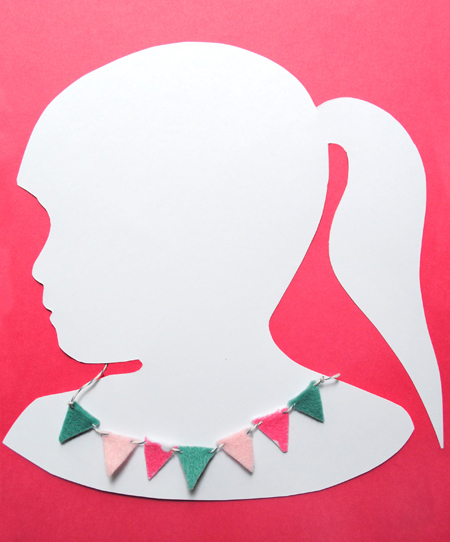 Have child line up their triangles the way they want their necklace to look. Tie knot on one end of string (refer to picture). Start sewing on the triangles by pushing the needle through the front side of triangle and coming back up on the other side. Continue doing this until all triangles are strung. Tie a knot at the end of the last triangle. My favorite way to finish off a child’s necklace is to make a sliding knot. The sliding knot lets you adjust the necklace’s length without untying the knot. With the right-hand end of the necklace, tie a not onto the left-hand side. 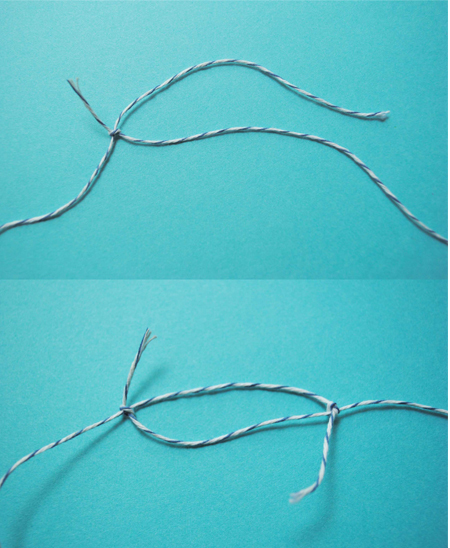 Now, take the left-hand end of the necklace and tie a knot onto the right hand side (refer to pictures). Trim ends. Done! The sliding knot is genius! So is the necklace, can't wait to try with my campers! Oh this is a neat idea, and I thought of cutting out the little flags from suede and connecting with jump rings or stringing on a thin leather cord to make it more grown-up wearable. :-) Great idea! What fun! I wonder how I can modify to make it more boy friendly. This a wonderful introductory sewing project. I am collecting simple sewing ideas and this one is perfect, not too overwhelming. Thank you. What fun! I can't wait to see all the projects. My kids are making bracelets for Craft Hope this week. Then I'm sure I'll be using some of these projects. We're hosting a sewing school one afternoon a week at our home for some of my daughters friends. It's our first year, we're really excited. I'm so going to try this! My daughter gets out of school next week and she will love this!! Thanks! That is such a cute idea! I will def have to save this and try it with my kids!! Oh Cindy...I actually host Craft Camp at my home each year for one week in the summer for girls. I'm always racking my brain to come up with new crafts and you and Jessica just made it easy and exciting. The girls will love this craft! Thanks for the great idea!